Experience-dependent changes in neural activity initiate within neurons a complex biochemical response. The ultimate effects of this biochemistry are to produce short-term (transient) and long-term (long-lasting) synaptic plasticity. Basic research continues to identify more and more of the signaling pathways and other cell biologies that underlie this synaptic plasticity. The first of these to be discovered was the cAMP pathway (Figure 4), a cascade of enzymatic reactions that transduces extracellular neurotransmitter release into intracellular changes in the functional states of many proteins. Neurotransmitters, their corresponding receptors and cytoplasmic PKA appear to regulate short-term plasticity, while activation of the transcription factor CREB (cAMP response element binding protein) is required to produce long-term plasticity. Figure 4. The biochemistry of memory. Increases in neural activity cause release of neurotransmitters (Tr). Activation of the corresponding receptors (R) induces the cAMP second messenger pathway (GABY(TODO -- FIX), AC, PDE, PKA, CREB) - an intracellular response that modulates various cellular processes involved in short-term and long-term change. In all species studied so far, the CREB gene is expressed in two opposing forms -- an activator or a repressor of downstream, CRE-mediated gene transcription. Key behavioral experiments in Drosophila originally established a critical role for CREB in the formation of long-term memory. Normal fruit flies are capable of learning the association between a particular smell and the punishment of foot shock. After one training session, a majority of flies will avoid the previously shock-paired odor when given a choice between it and a neutral odor in a T-maze. Though such learning initially is quite robust, memory thereafter is transient, decaying away within a day. In contrast, a bona fide protein synthesis-dependent LTM lasting more than a week can be produced in normal flies when subjected to ten training sessions with a 15-min rest interval between them (spaced training; Figure 5). In flies genetically engineered to produce high levels of CREB repressor, LTM specifically is blocked (Figure 5) with no effects on learning or early memory (not shown). In flies genetically engineered to produce high levels of CREB activator, LTM after spaced training is not affected but, surprisingly, is induced after just one training session. Figure 5. Genetic manipulation of long-term memory in Drosophila. Memory lasting at least seven days (LTM) in normal flies (yellow) is not produced after one training session (normal 1x) but is after spaced training (normal spaced). 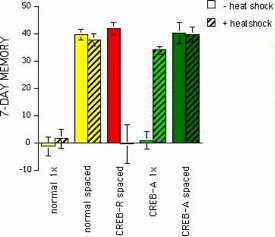 In genetically engineered flies, heat shock (30 min at 37°C) induces expression of CREB repressor (red) or CREB activator (green). Heat shock in flies carrying CREB-R has no effect after 1x or spaced training but completely blocks LTM after spaced training (CREB-R spaced). In contrast, heat shock in CREB-A flies has no effect on LTM induced by spaced training (CREB-A spaced) but renders them capable to form LTM after one training session (CREB-A 1x). In short, overexpression of CREB activator enhances memory by reducing the number of training sessions required to induce the formation of LTM - the functional equivalent of a photographic memory. Figure 6. Brain plasticity and long-term memory. Developmental processes initially give rise to complex neural circuitry, which then registers new experiences by an increase in neural activity. Neural activity induces a biochemical response that includes the CREB pathway. When the CREB pathway is sufficiently stimulated (usually via repetition), it regulates the expression of genes involved in a synaptic growth process, which ultimately changes the connections among neurons in the circuit. These changes in synaptic connections, distributed throughout the circuit, represent the physical basis of long-term memory. DNS was formed initially to discover drugs that augment the biochemistry of memory formation. Since these seminal experiments in Drosophila, molecular studies in several animal models have begun to elucidate further the biochemistry of plasticity and to link various aspects of synaptic plasticity with memory formation, leading to the following general view of brain plasticity (Figure 6): A new experience is registered in a specific neural circuit as a change in neural activity. This neural activity induces a complex inter- and intra-cellular biochemical response that still is being discovered. To date, however, a few key aspects of the process appear evolutionarily conserved. Stimulation of the NMDA receptor appears central to induction of both the local, transient biochemical response at the synapse and the long-lasting biochemical response in the cell nucleus (phosphorylation of CREB). 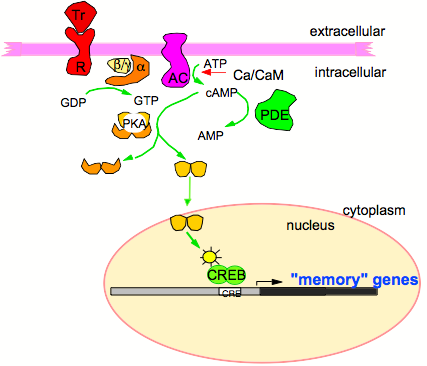 Several intracellular signaling pathways appear to be induced initially by neural activity, but CREB nonetheless appears to be a dominant "downstream" target, regulating the conversion of early memory to lasting memory. Down-regulation of CREB suppresses, while up-regulation of CREB enhances, a gene transcriptional response underlying a synaptic grow process that yields lasting functional and structural plasticity at synapses. In essence, CREB appears to act as a master switch that determines when neural activity will give rise to lasting, structural changes in a circuit. A key factor influencing this switch is repetition; when the CREB pathway is up-regulated, the number of training sessions required for the formation of long-term memory is decreased.